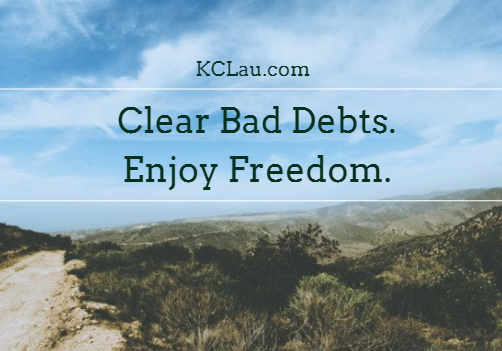 Today, regardless of what the amount of ‘outstanding balance’ it may be, let’s be rest assured that there is definitely a way out for you and you’ll eventually enjoy a freedom that comes after being fully released from your bad debts. #1: What’s a Bad Debt? First, we must understand that all debts are not necessarily bad and there are two types of debt: Good Debt and Bad Debt. Good debt is debt that makes you richer. For instance, property investors are experts in using debt as their leverage to expand their property portfolio and thus, have become richer and wealthier as their properties’ value continue to appreciate over time. Bad debt is debt that makes you poorer. For instance, many borrowed money to buy things where their value drops over time, thus, resulting in the person becoming poorer. These debt include credit card debt & personal loan where their interest costs are substantially higher than good debt like a mortgage. For some, life did happened. Perhaps, it stems from medical bills, or a failure in business or experiencing a pay cut, a job loss or any form of setbacks that are really not a laughter matter. If that’s you, just know this: It’s temporary & you may proceed to Point #3 onwards to work on the solution. -Buy stuff that you don’t really need? -Go on a holiday trip overseas? – Keep up with the Joneses? – Protect your image of success? – Impress people whom you care but doesn’t truly care about you? The list above is just a few examples to get your brain going. Please treat it as an exercise. The goal is to know yourself better so that you can take a U-Turn in your financial situation for the better. If you are young and single, you may consult your parents for some financial advices. In many cases, you might even receive some financial grace which is much needed as a temporary relief to your problems. But, with that said, you might lose a valuable chance to improve your financial intelligence as you’ve been bailed out. But, if you opine: ‘Ish… Malu-je. I still want to solve the issue like a man’, then, your next best option is to find a friend whom you trust & more financially savvy than you to impart some financial wisdom to you. If you are in a relationship, it’s ideal for you to work on these financial issues as a team. It’s helpful, but not easy, to be transparent about it and to find the solutions together. One thing is for sure: Both of you will come out stronger and more refined as a couple after you have cleared your bad debts. – Your Outstanding Balance of each Credit Cards & Personal Loan. – Your Interest Rate for each Credit Cards & Personal Loan. – Your Monthly Payments over the next 12 – 24 months. If you are not sure how to do that, you may get a trustworthy friend to work it out for you. All in all, a Spreadsheet is one which gives a clear overview of your debt position so that you can strategize and prioritize which bad debt you want to clear off first, second, …. until the last one. If you have little financial resources to work with, you may set a small goal to raise another RM 500 a month which is dedicated to clear off your bad debt. It may be hard initially. But, if you have learnt how to raise RM 500 a month to clear bad debts, very soon, you’ll also know how to raise even more which could be used for your investments to get rich. – Do More Sales if you’re a salesman. – Take up one or two freelancing job. – Sign up as a Uber or Grab Driver. – Have a part-time job. – Give tuition classes to school kids. – Refer customers to your business friends for commission. – Join MLM, sell insurance, but please … don’t join money games. – Track your expenses. You’ll find items to cut on very quickly. – Say ‘No’ to expensive social gatherings. – Say ‘No’ to smoking, alcohol, nightclubs and KTVs. – Say ‘No’ to gambling. – Cancel expensive gym memberships. Run in the Park. – Cancel Low-Yielding Unit Trust Investments. – Cancel Endowment Plans with Low Sum Assured. – Quit drinking Starbucks or just reduce four RM 15 drinks a month. – Is it on an Effective Rate or Flat Rate? – Is it calculated based on an Annual Rate? – What are the Clauses for Early Repayment? – How much is your Monthly Repayment after doing Balance Transfer? If you are not sure whether a Balance Transfer is to your advantage, you may consult a trustworthy friend first before proceeding on it. Please don’t forget to live life. For instance, if you made it a goal to raise RM 500 a month and you did just that in the first month, celebrate that…. with a ‘Milo Kosong Beng’. Haha. – Did I save RM 250 a month? – Did I make an extra of RM 250 a month? – Did I clear debt on one of my credit cards in 3 months? These small goals are important as they keep you focused on the needful on a daily basis whilst working towards true freedom from bad debt.